Today, the Barrett Art Center/Dutchess County Art Association stands committed to its artist-members, its multilevel art educational program, its immediate community and the larger Hudson Valley region. It supports regional artists, mounts exhibitions of national caliber, and features quality exhibitions of contemporary as well as historic art in its formal galleries. Our changing exhibition program consists of a variety of thematic exhibitions developed to foster and enhance the level of appreciation of the visual arts. For regional artists, the Barrett Art Center/DCAA offers numerous opportunities to exhibit their work throughout the year, in juried competitions, open exhibitions, and special invitation shows. To provide a local venue for viewing the very latest trends in contemporary art, two national exhibitions are presented annually: New Directions and Photowork, both juried by outstanding art professionals from such prestigious New York City institutions as the Whitney Museum of American Art, the Museum of Modern Art, the Brooklyn Museum, and the Guggenheim Museum, to name a few. In addition to the exhibitions presented in the main galleries, our upstairs gallery serves as a space for selected solo exhibitors. In addition to a monthly exhibition program, the Barrett Art Center operates a School of Art.The Barrett School of Art offers classes and workshops in a variety of art disciplines including: painting, drawing, printing, photography and clay. The School of Art is noted for maintaining the "salon" style of instruction, which emphasizes small class sizes and plenty of individual attention for students of all levels, from the novice to the serious artist. The fine art and photography classes held at the Barrett Art Center, and the ceramics at Barrett Clay Works are taught by talented, enthusiastic, highly qualified Hudson Valley and tri-state area professionals. We also offer offsite classes when appropriate, for example, pleinair workshops are offered at some of the wonderful Hudson Valley Historic sights in Dutchess County in the warmer months. In addition to the large classroom on the second floor of the Barrett Art Center, Thomas Barrett's original studio, on the third floor has been remodeled to include a photographic darkroom and printmaking facilities. These facilities are available for class use as well as for members and the public who may wish to experiment with the photographic and/or printmaking process. The first floor of Barrett Clay Works has a large classroom suitable for wheel throwing, hand building as well as special workshops. For over 20 years the DCAA/Barrett School of Art has been a leader in quality art education in Dutchess County. BAC's Library serves as a special place to read and research. Aside from members' borrowing privileges, the library also is a meeting place for members and students of the association. 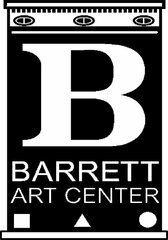 Barrett Art Center/DCAA's goal is to offer a fully-dimensional art experience for both artist and art appreciator. To achieve this, our exhibition and educational programs are augmented with seminars, workshops, special lectures, outreach and community events, services for members, as well as bus trips to outstanding exhibitions at major museums from Boston to New York City. Barrett Art Center/Dutchess County Art Association provides total immersion in the visual arts. Just as Tom Barrett envisioned, it serves as a community meeting place for artists and art enthusiasts, an art center as exciting as it is functional.